When the time comes to count the cost, men will be amazed at, and ashamed of, the waste of war. More than any other activity of men, war eats greedily into resources and lives. Nothing is spared in the effort to overcome the ‘enemy’; everything is sacrificed to the attainment of victory. Thus has man waged relentless strife against his neighbour, and not always in self-defence. As often as not, war has been used for the expansion of territory, the accumulation of plunder or, most abhorrently, the capture of slaves. The ‘spoils of war’ is a phrase used lightly to describe the underlying purpose of most wars. Today, we have reached a time when men must take seriously the task of ending war. Men must understand that there is no problem or situation which needs war to solve or cure. This being so the nations must together act and end for ever that destructive aptitude of men. Should they fail to do so, they threaten the very existence of the race. Peace is no longer an option for men: they have now in their hands the deadliest weapon of all time which, if used in major war, would desecrate the planet and leave it lifeless for aeons of time. Why, then, court such disaster, such an end? Maitreya, you may be sure, will speak thus on His emergence. He will show men that small wars can lead to terrible consequences, and set men on the slippery slope of self-destruction. He will counsel gravely and turn men from the unthinkable. Be vigilant but not afraid; trust Maitreya to wisely guide the actions of men. Play your part in the task of educating your brothers and sisters and so make lighter His burden. Tell all who will listen that the Expected One is here, ready to begin, openly, His Mission. That He relies on the men and women of goodwill to work with Him for peace and justice, freedom and love. Tell them this. Tell them that Maitreya has the simple answer for the world’s woes. That sharing will engender the trust that will open the door, and the hearts of men, to blessed peace. Then will you see the flowering of the human spirit in brotherhood and co-operation. Then will the problems and blockages melt away, overcome in overflowing goodwill. Thus will it be, and thus shall we witness the end of the abomination of war. Such is Maitreya’s purpose and firm is His will for its accomplishment. (1) Is this the kind of pressure Mr Creme meant? (2) Do the American people see through this libellous propaganda? (3) Chavez claims the US is trying to oust him – is this true? A. (1) Yes, the beginning. (2) Some of them, no doubt, yes. Enough of them, no. (3) Yes. Q. A 7.7 magnitude earthquake struck off the coast of Indonesia on 21 January 2006. Was this a natural event? Q. I have been reading the book Maitreya’s Teachings: The Laws of Life edited by Benjamin Creme. In this book it discusses how the Earth has moved closer to the sun, causing the Earth to warm up. How much of global warming is due to the Earth moving closer to the sun, and how much is due to pollution of the Earth’s atmosphere? A. Warming due to Earth moving closer to the sun: 20 per cent. Warming due to pollution of the atmosphere: 80 per cent. Q. A sea plane crashed into the ocean at Miami Beach, Florida, killing all 20 people on board on 19 December 2005. The wing had apparently fallen off in flight, which could have been due to cracks that were later discovered on a support beam. I remember it being said that due to America’s misguided use of laser technology for the purposes of warfare there would be plane crashes as the karmic result – some planes would literally fall apart in the air. Is this a case of that (or some other) karma working out or was the tragic crash in Miami an accident? A. Yes, it was karmic. Q. In 329 BC Alexander the Great noticed several shining, shield-like objects emerge from a river in India. He was convinced he witnessed otherworldly vessels. (1) Were these real UFOs? (2) Alexander the Great spent the remaining six years of his life searching for these craft in a diving bell. Some speculate that he was trying to find and conquer the only kingdom that eluded him thus far: Atlantis. Did Alexander the Great indeed have grandiose illusions about conquering Atlantis? A. (1) Yes, from Mars. (2) No, but he wanted to find the source of these ‘otherworldly vessels’. Q. In July 2002, nine miners were trapped and feared dead in a mine in Quecreek, Pennsylvania, USA. However, all of the miners were rescued after three days 240 feet below ground level. Did Maitreya or the Masters assist the miners in any way? Q. Crosses appeared in private homes long before 1988. My husband and I bought a house in Oxford, Nova Scotia, in January 1977. On a Saturday in February we moved in, and on the following Wednesday around 8am a beautiful cross of light appeared on our wall at the foot of the stairway. It lasted for about 10 minutes and left. It came back for two more days at the same time. The following February, the cross appeared again for three days. For six years it returned. We moved in the 7th year. A. The crosses were manifested by Maitreya as a sign of His coming presence on 19 July 1977. Q. I don’t understand why we have to create a climate of expectancy for Maitreya to come forth. There’s a very real problem with trying to create such a climate. If I tell people Maitreya is here they will just say: “Who?” Christians will only respond if you call him Christ, but then you alienate Buddhists and Muslims. If you tell people Maitreya is a Christ figure, then atheists will be turned off. If you say he is just some person whose ideas will make the world better, they won’t believe you, because hitherto no such person has existed. A. What makes you so sure? Try it and see what happens. Some people will be interested; some will take you seriously. Some will believe you have told the truth. Some will laugh and walk away. So what? You are not alone. Q. The catch-22 about telling people about Maitreya is enormous and so discouraging, why bother trying? A. Because every time you tell someone about what is happening you help Maitreya and the world. Q. We live in a very cynical, sceptical, jaded age. Call me defeatist but if Maitreya is waiting for such a climate to come forward he is going to wait forever! Most people are selfish and don’t care about sharing. Atheists don’t want to hear about anything ‘spiritual’ so they won’t respond to hearing about Maitreya. Most everyone else won’t believe it either. A. Yes, you are being rather defeatist. You believe it. What is so special about you? Several thousand people have been engaged for years in cheerfully making known this information at different levels of commitment. Some 30 million people have heard it. Of these some 20 million (that is two out of three) have an open-minded response, are open to the possibility. Over 2 million believe absolutely in its reality. Cheer up! A. You gave out one too few flyers! We do not have to inform every person in the world but only form a ‘critical mass’. For over 30 years Benjamin Creme has presented information about the Emergence of Maitreya, the World Teacher. Questions and answers about Maitreya, His qualities and nature, the significance of His return to the centre of our modern world and the transformative effect of that extraordinary event have filled 10 volumes of Benjamin Creme’s books. Over the last quarter of a century his Master, too, has described Maitreya, giving readers an intimate insight into the nature of One so evolved that He embodies the Christ Principle, the energy of Love. The Master has also outlined Maitreya’s priorities, His concerns, the manner in which He will emerge, and has given a foretaste of the wisdom, insight and compassion He will demonstrate. The following selection is a fragment only of the very large body of information about Maitreya, and includes quotations from Maitreya (Messages from Maitreya the Christ, Maitreya’s Teachings – The Laws of Life), Benjamin Creme’s Master (A Master Speaks), and Benjamin Creme’s writings. The following is a fragment of a compilation about Maitreya. For the complete compilation see Share International March 2006. As a Teacher, Maitreya is beyond peer; We, His immediate disciples, know this to be so. Ages-long experience has taught Him the Wisdom, the loving understanding, to enter into the hearts and minds of all, and thus to inspire all to emulate His attainment. Even today, many are beginning to respond to His unseen presence and are finding within themselves that this is so. When Maitreya emerges fully and openly, this process will quicken dramatically until all will know that the Christ is once again living and teaching among men. The Art of Living was the theme of Benjamin Creme’s keynote talk at the American and European Transmission Meditation Conferences in 2005. 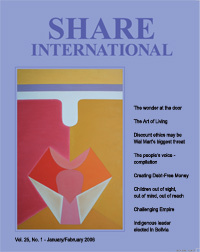 The talk was published in Share International January/February 2006. We reprint below an extract from an article by Benjamin Creme’s Master on the same theme. “Before long, a great change will take place in our approach to life. Out of the chaos of the present time will emerge a new understanding of the meaning underlying our existence and every effort will be made to express our awareness of that meaning in our daily lives. This will bring about a complete transformation of society: a new livingness will characterize our relationships and institutions; a new freedom and sense of joy will replace the present fear. Above all else, mankind will come to realize that living is an art, based on certain laws, requiring the function of the intuition for correct expression. The Conference Questions and Answers in Part One (Share International March 2006) focus on the following topic areas: the Law of Karma; the Law of Harmlessness; conflict resolution; harmlessness and harmfulness; and the Law of Sacrifice. A selection of the questions and answers are included below. Q. Would you please give a few examples of how we might make best use of the Law of Karma? A. The best way is to be harmless in every situation. Most people will be harmless in one situation and harmful in another. There are very few people (they must be saints if they exist) – apart from the Masters, Who are saints – who are harmless in every situation. Because of our glamours, our conditioning, inevitably we are harmful in some situations, less harmful in others, perhaps not at all harmful in others, but in enough to create our karma. The answer is very simple, although difficult. Like everything, it requires discipline. To be harmless in every single situation – think of the control that one needs. Control can be made easier by meditation and by the positive, definite function of the will to be harmless in as many situations as we recognize. We will be harmful in many situations and not even recognize the fact; I am sure this happens all the time. It is only afterwards that we realize how harmful we have been. I am sure, for instance, that Mr Bush is a sincere Christian. Yet look at the harm he did in Afghanistan, at the harm he has done in Iraq. The harm he and those around him are doing to the liberty of the American people right now, thinking up ways and means of curtailing their liberty. All of us have the illusion that we are harmless. We know the length to which we would not go, but anything up to that, if it is necessary, is acceptable. We are often harmful, knowing that we are harmful, but not appreciating the depth of the harm, and able, because of our glamours, to rationalize it away altogether. It always mystifies me how some people I have met, so versed in the Alice Bailey teachings that they actually lecture on them, have said to me: “I go along with everything you say about the coming of the Hierarchy and Maitreya and so on, but what I am unable to take is this idea you have of sharing the resources of the world.” It staggers me. I do not know what they have been reading, or how they have read what the Master Djwhal Khul says about the sharing of resources. It is one of the main subjects in the Problems of Humanity. This belief is held in all seriousness: “We do not have much, but what we have is ours. We have worked hard all our lives for what we have,” (living in one of the better parts of Southern California, on the beach!) “I do not see how we need to share what we have with people that we do not even know.” “They might have long hair or Rastafarian haircuts!” Or “Why do they (the starving millions of Africa) not lift themselves up by the bootstraps as we have done?” That is how we hoodwink ourselves, how we put this glamour over the reality that we do not want to see. We are able to exclude it nicely, find some rationalization for it. If you want to, you can rationalize anything. You should hear Mr Blair rationalizing why Britain went to war in Iraq, why it was not something he had to apologize for (and has never apologized for) even though 70 per cent of the British people were against it. The advice from all the best minds in Britain were against it, not to mention the French, Germans and the other Europeans. It is the easiest thing in the world to rationalize. Certain rays, and certain kinds of minds, therefore, make it easier to rationalize away the things that are uncomfortable. They are uncomfortable if you see them. But you can rationalize them away, put them behind you and ‘steer forward into the future’ like Mr Blair and Mr Bush are doing. They want you to forget their mistakes and see only what they tell you are the possibilities ahead. All governments do it. They have done so from time immemorial, and will go on doing it, given the chance. It is up to us to not give them the chance…. Q. How can we resolve conflicts harmlessly? How does the time element tie into harmlessness? Can true forgiving wipe out some harm? A. Well, how would you do it? There is not one way to solve conflicts harmlessly. There is a way which if followed will eventually work out and, in the most harmless way, resolve to the greatest extent the conflicts and that is to accept that you need to give in order to receive. If you have two people, and you have a conflict which involves both of you, say a conflict about land or water or oil, for example, how do you do it? You meet with the other side and seek a compromise, something that satisfies you both. It will not be all that you, from your position, would hope to gain but, by giving a certain amount, not demanding the full 100 per cent of your rights, and your opponents also approaching it in the same harmless way, sacrificing again some of their rights, you reach a compromise. By using wisdom, wise compromise, you arrive at an acceptable agreement and so keep the peace or end the conflict without any further harm. Q. How does the time element tie into harmlessness? A. If it is like the Israelis and the Palestinians, you meet endlessly for years and the Palestinians make some compromise and the Israelis say: “No, it is not acceptable.” Then the Israelis offer a tiny, miniscule compromise, something that is practically meaningless and, of course, the Palestinians reject it outright. And then the Israelis say: “You see, they do not accept what we offer.” And so the fighting goes on. You have to do it with truth. You have to be honest in what you are doing. For one thing, you have to want the aimed-at result. In the Palestinian/Israeli situation, the Israelis obviously do not want the peace. They want peace, but not at the expense of giving up the West Bank. The West Bank was negotiated for the Palestinians by Maitreya with the King of Jordan in April 1991, at a Conference of leaders in all fields hosted by Maitreya in London. Maitreya asked King Hussein if he would give up sovereignty of the West Bank, which has been in the hands of the Israelis since the Six Day War of 1967. King Hussein agreed on condition that it became a homeland for the Palestinian people. The Israelis have never had any intention of giving up the whole of the West Bank. And there are Israelis, not all Israelis, but a large minority, who are sworn never to give up the West Bank, the land of Canaan which, as far as they are concerned, was granted them by God thousands of years ago. The Palestinians, for their part, have a minority who have sworn to resist the presence of Israel in the land which has been theirs for centuries. And so you have fanatics on both sides who will never give in, and you have to aim at a compromise which will bring a just peace. Personally, I think only Maitreya can end the Israeli/Palestinian situation with an agreeable compromise, with the Palestinians accepting the existence of Israel, and the Israelis accepting the right of the Palestinians to the West Bank and a just and viable independent state. How does the time element tie in? In the Palestinian/Israeli situation you can see how time is very important. It drags on and on with no resolution. It changes its focus. People, like President Arafat, die; the King of Jordan died and that changes the situation. The Israelis and the Americans think they can take advantage of the situation because they have sidelined Mr Arafat. The Palestinians no longer have a leader, and so it is thought they will be more amenable to accepting the injustice which has been offered them to date. Until there is an acceptable and just compromise there will be no end to warfare there…. Q. Can you elaborate more on the Law of Sacrifice. How does it work? A. As a person grows, aspiration draws him/her higher and higher and when the higher is attainable you find that it is only attainable through sacrifice. You have to sacrifice that which you no longer need even if you have needed it all your life to that point. It is no longer of use to you in the higher vibrational state in which you now are. If you sacrifice the lower, you sacrifice the vibrational state of the lower for the higher vibrational state. Every time your vibrational life is enhanced and you go up a notch in vibration, you draw to the bodies, physical, astral and mental, subatomic energy, which is light, so that the bodies are transformed gradually. You cannot keep the lower vibrating matter which is now being turned into light. You cannot have the lower vibration coexisting with the higher vibration. It is so simple really. It obeys a natural law. There is nothing mystical about it. If you do something which takes you to a higher level, you are changing the vibrational rate, therefore, you cannot keep that which is still vibrating at a lower rate. You have to give it up, sacrifice it. If you are making a change in the vibrational nature of your vehicles, you can only do so by getting rid of the lower vibrational rate that they were before. So that lower matter has to go back into the matter of the universe, the life of the planet in which we live. You cannot take it with you…. On Saturday 7 January 2006 I went to my local Sainsbury’s [supermarket]. I had the blues after several weeks of health problems and was struggling to restore a more optimistic frame of mind. I was amazed at the ease with which he sang so enchantingly. He moved along, singing as he went and I had no doubt that the song was word-perfect. In delight I turned round and continued looking at him. Then I noticed that out of his pockets came a myriad vividly-coloured streamers. This shock of colour touched my drooping spirits and I laughed out loud. I recalled having read a letter in Share International magazine where Maitreya had appeared in brilliant orange clothes. I spoke with another shopper who was standing nearby and enthused about the beautiful scene we were witnessing. He smiled pleasantly and seemed to concur. Later I wondered if he knew what I was talking about. I didn’t want this experience to end and went off in search of the singer. I soon found him, busily adding more items to his trolley and singing with the same ease and beauty. His repertoire had changed and I don’t recall the song. I decided he was a lovely eccentric who liked to sing as he shopped and I felt grateful to him for lifting my spirits. I thought of thanking him but decided against this and left. When I got home I had a strong feeling that he was Maitreya. Is this correct? If he was Maitreya did anyone else see him or hear his singing? I was in Tehran, Iran, over Christmas and the New Year 2006 visiting my family. I was interested to visit the well in which, legend says, the Imam Zamaan (Maitreya) disappeared a long time ago at the age of 18 and where he will reappear when the world is in turmoil and the need of humanity is great. We hired a taxi as it is a two-hour journey from Tehran and when we arrived the weather was so warm and sunny and the mountains looked so beautiful and the place had a calmness of its own. My cousin and I first went to the Mosque where she did her special prayer and I did meditation and then went to the place where the well is situated. The tradition is that you write your wish on a piece of paper and drop it down the well. We both wrote our letters and ‘posted’ them. My cousin asked me if I thought that he would pick up the letters and, because I knew that for many years He is amongst us and helping us, I said that of course He would. The next day my mother and I went to the bazaar on the bus. We caught the ‘bendy’ bus which has room for women to sit. As we sat down I noticed a man in his 50s with broad shoulders, a well-trimmed beard and well-cut suit. He looked very dignified with a leather briefcase in one hand and his other hand was full of tickets. He was standing by the rail that divides the men from the women and with a quiet voice asked for the tickets. We all passed our tickets one to another to the lady at the front. As I looked at him I wondered what a man like him was doing on the bus, never mind as a conductor. I felt he should more appropriately be at university as a professor or something. He looked quite serious as if he had a lot to think about. He seemed to me as the best of humanity. Was this wonderful conductor Maitreya and was his briefcase full of people’s needs and wishes? E.P., Southend on Sea, Essex, UK. In 1980 when I was about 12 years old, I had a dream of pure, bright, light which gave me an immense sense of tremendous love and truth. At the time, I believed emphatically that I had had an encounter with Jesus, even though I came from a family which did not encourage religious, or spiritual beliefs. This dream has often guided me, and given me joy and spiritual sustenance. Now that I have read a lot about Maitreya, I wonder if the dream came from him, or possibly Jesus? On Sunday 28 January while I was giving a talk at the Share International Information Centre in Amsterdam a young woman of about 30 came in a little late. During the talk she chimed in from time to time, always usefully. She brought up the issue of people power. She said people always say: “What can I do, just one little individual?” but she added: “A better world starts with you.” And with real enthusiasm she said we should think of how much various individuals had accomplished in the past – both positive and negative examples – and let that inspire us to work with others and to take action. She meant we’re not alone, we can join forces with others and achieve a lot. I replied that I was pleased she had brought up the subject of people power and asked Diny, a group member, to please bring a copy of the latest (Jan/Feb 2006) issue of Share International which has a substantial compilation on the Voice of the People. Both Diny and I read quotations from it. I said that that was true although there were also miracles as a sign. She repeated her idea expanding on it: “Yes, but miracles aren’t really miracles, but the Divine Being inside each one of you – now that’s the real miracle.” She went on to say something to the effect that if you knew that, if you got in touch with that Divine Being in yourself, then you didn’t need miracles, or that you would see they weren’t so important. She said she was a refugee from Angola and knew about privation, political corruption and poverty. Since it sounded as if we never get more than three visitors I asked if she had been to Benjamin Creme’s lectures and mentioned that he would be giving a lecture again in September to a very large audience. We looked at the calendar together and she got out her diary and made a note of the date. I recommended the lecture, saying that that would give her an opportunity to experience the overshadowing by Maitreya of the audience through Mr Creme. She nodded and said she would try to come. Then she changed the subject and said that from personal experience “I find that meditation is really very, very important”. She was about to leave before the question and answer session but Diny invited her to stay a little longer. She laughed and said it was “tempting” and “well, yes, she would stay a while longer”. Later, as she left, she said she loved us all and would definitely see us again some time. She was never a nuisance, though unusual. She interrupted, or rather chimed in, but wasn’t disruptive. I was pleased that she brought up various topics. She was small, fine-boned, had nice golden coloured skin, long black hair and dark eyes. She seemed happy, poised and independent, quite sure of herself but sometimes girlish, laughing slightly shyly. I felt no amazing energy. I didn’t think anything of the incident until the following morning when I began to wonder whether she was anyone other than a pleasant visitor. Was she? Huge encircled crosses of light are appearing though the bathroom window at my mother’s home in Pawtucket, Rhode Island. They were first observed on Christmas night [December 2005]. Were they manifested by Maitreya? In the city of Sault Ste Marie, Ontario, Canada, on St George’s Hill, there is a 120 foot illuminated steel cross, the first sight seen by many US visitors crossing the International Bridge into Canada. It is intended to be a symbol of spiritual unity at the geographic centre of North America and has become known as “The Cross at the centre of the Continent”. At the foot of the cross is a non-denominational Oasis of Peace garden, as well as a French language school, Notre Dame des Grands Lacs. On Monday, 24 January 2005 the school’s principal Stephane Picard, its groundskeeper Gerry Ouellette, maths teacher Christopher Gravelle and a large number of students saw the steel structure swaying from side to side during a 2.5 hours period. “About 25 to 30 feet below the cross-arms, down to the bottom, was stationary”, said Gravelle. Above that point the cross moved from left to right, a foot in each direction. He began to time the rhythmic movement, which worked out to about 44 beats per minute. “It was constant, like a metronome and it was going left to right,” he said. So concerned were the teachers that classes were temporarily moved to the school library for safety. A local newspaper in Cheshire, UK, has received a series of eye-witness reports of strange lights in the skies. That same evening, from about 6.20-7.40pm, “a remarkable light” was seen over the Staffordshire town of Stone. “It seemed to be circling around overhead, and was like a hazy blur,” said Mr Soper. “We thought it could have been a laser show at Alton Towers” – but the local theme park later confirmed it had not put on any laser displays that night. Reports of the incidents in a local newspaper prompted a flood of calls describing similar sightings, including Sally Keighley, from Nantwich, Cheshire, who noticed, at about 6.50am on 18 January, in the skies west of Coxbank, “a very bright light in the sky which suddenly vanished after a few seconds…. It was not a pulsating light, but constant, and vanished in an instant”. Nantwich resident Rob Brereton described seeing on 20 January “a series of yellow, flashing lights in the sky in a ring formation” in the clouds above the town centre. ‘Oscar’ is a fish with a special message. He lives in a fish tank in Water Aquatic, a petshop in Waterfoot (about 30 miles north of Manchester, UK). The two-year-old Albino Oscar fish has been receiving a great deal of attention since Muslim members of the Waterfoot community noticed that markings on Oscar’s scales spell out the word “Allah” in Arabic script. Moreover, it seems that Oscar carries not just one message but a further miraculous sign on the other side of his body – the word “Muhammad”. Oscar, who was imported from Singapore, has been filmed and photographed, and has appeared in newspapers and on television. One visitor says the night before news of Oscar reached the media, he had dreamt of a whale with the words “Muhammad” and “Allah” on its head. “It’s real, it’s real,” he said. “As soon as I heard I came running. I didn’t think twice about the dream until I saw the fish on the television.” He inspected Oscar’s scales and was convinced that the markings are genuine. He said he believed it was a sign from God. In June 1988, Maitreya’s associate intimated that signs of Maitreya’s presence would increase: “He is going to flood the world with such happenings that the mind can never comprehend it.” In May 1988 crosses of light were first reported in the El Monte district of Los Angeles, USA. Since then, crosses of light have appeared in windows in many parts of the world, including Canada, Japan, Germany, Slovenia, the USA, the Philippines and the UK. Since 1988 Share International has published reports of crosses of light of many shapes and sizes, including, for example 40-foot crosses which appeared in the windows of the Copper Ridge Baptist church in Knoxville, Tennessee, USA. On the evening of 12 January 2006 we held a lecture on the Reappearance in an esoteric centre called Akazienhof on Akazienstr. 27 in Berlin. During the lecture we had covered some of the miracles including the crosses of light about which we spoke for longer than we had planned since there were also some questions about them. After the end of the lecture one of the listeners, an elderly woman, came back and was very excited and said that on her way out she had seen crosses of light in windows in the staircase. So we checked and they looked like genuine crosses of light. Although we had held a couple of lectures there before no one had noticed crosses of light in the staircase. A strong energy emanates from them and we were very happy. P.S. and O.S., Berlin, Germany. The following is the first part of a book review of Professor Jean Ziegler’s book L’Empire de la Honte (Empire of Shame). For the complete review see Share International March 2006. Well-known activist and writer Professor Jean Ziegler is the UN Special Rapporteur on the Right to Food and is also a senior Professor at the University of Geneva and the University of Sorbonne, Paris. He teaches sociology and has written many books, including books about hunger. In his book L’Empire de la Honte (Empire of Shame), he explains the mechanisms which enable multinational corporations to behave like new feudal rulers, and how they use debt as a weapon of mass destruction to force national governments and their populations to give up their sovereignty and freedom for the sake of vested interests. “Eu tenho cola, porque no tenho vida – I have glue [to sniff] because I have no life,” a little girl in Recife, Brazil, told Jean Ziegler while he was investigating the impact of debt and hunger in that country. The reality of hungry or ill children with no hope, future, education or family life can be directly attributed to the country’s foreign debt and its relations with rich countries and multinational businesses, Ziegler says. Between 1964 and 1985 Brazil’s debt increased by 50 per cent due to military expenditure incurred under the pretext of protecting “national security”. Foreign investors were offered incentives like tax cuts and other financial benefits but since Brazil could not make such provisions it was forced to become financially dependent on the IMF, the Eximbank (an agency of the US government providing aid in financing and facilitating imports and exports), and other private Western banks. In 1979, the USA raised its interest rates, and Brazil fell into the debt crisis trap of having to take new loans in order to be able to pay off interest on previous loans. Years later, President Fernando Cardoso chose to raise interest rates in Brazil to attract desperately needed foreign capital. The immediate impact on small businesses was catastrophic; unable to get access to credit, they had to cut back on their activities and dismiss employees. Worse still, the rise in interest rates fuelled speculation. Both foreign and Brazilian investors took personal loans at high interest rates in order to buy Brazilian government bonds. A combination of “heavy Wall Street pressure” plus the IMF rescue deal increased the pressure on the Brazilian government for further privatizations in mines, telecommunications and the petrol and electricity industries. Unemployment rocketted and billions of dollars’ worth of national assets were sold off to multinational corporations. The ‘conditionality’ of the loans granted by the IMF was that the Brazilian government undertook to maintain economic growth at 3.75 per cent per year. This guaranteed creditors that Brazil would be able to pay back its debt and interest. As a direct consequence, social spending budgets were inevitably slashed and the welfare of the poorest sections of the population was sacrificed to debt servicing. Shockingly, the Brazilian case is not unique but can be found again and again in various countries and guises throughout the world, says Professor Ziegler. He provides ample illustration throughout his book, with a wide variety of concrete and detailed cases, from Mongolia to Ethiopia and other heavily indebted nations. Each case, though different in its pattern, ends in a similar outcome: increased poverty and millions of homeless, deprived people. Over 90,000 people attended the 6th annual World Social Forum (WSF) in January 2006, held for the first time in two locations – Caracas, Venezuela, and Bamako, Mali, – with a third forum scheduled for Karachi, Pakistan, in March 2006. In Caracas, the forum began with a massive peace march of 10,000 people. During the five-day event, 2,200 civil society groups organized nearly 1,800 seminars, panels, workshops and other activities on a wide range of themes, including alternatives to corporate globalization: ending war and imperialism, ecological sustainability, indigenous rights, cultural preservation, feminism, workers’ rights and organized labour, the role of the media in building a just society, and opposition to privatization of water and other natural resources. A highlight of the event was Venezuelan President Hugo Chavez’s address to 15,000 WSF attendees and local supporters. Chavez told the audience that “a new offensive has been unleashed from Latin America, Africa and Asia against the imperialisms of the world, by whatever name”. He urged the WSF to agree on “a work plan, an action plan to drive these efforts in Latin America, in Asia, in Africa”. Chavez accused the Bush administration of being the “most perverse empire in history”. Referring to the US as a global superpower, Chavez said: “This giant needs to wake up.” He encouraged people to “imagine a world in which the US administration brings peace to the world … giving $400 billion [not to the military but] instead to foster education and produce medicine and food for the people”. He vowed that “no matter how many mechanisms they put in place, no matter how much power they have ... they won’t be able to defeat us ... You can be sure of that”. Civil society groups attending the forum planned a day of international protests against the occupation of Iraq, to be held on 18 March 2006. Groups also made plans for protests and other activities in Mexico to coincide with the Fourth World Water Forum to be held there in March 2006. Attendees at the Mali forum discussed many issues of particular concern to Africa, including armed conflicts, the role of women, the consequences of economic liberalization, the worsening poverty of the rural poor, and Third World debt. According to the Mali forum co-ordinator Mamadou Goita, these issues were discussed because more Africans were able to participate in this year’s forum than in previous years’ events. Past World Social Forums were held in Porto Alegre, Brazil and Mumbai, India, which made it difficult for most Africans to attend. Sessions on women, for example, focused on female genital mutilation, early marriage and illiteracy among girls. Conflict areas including the Western Sahara, the Democratic Republic of Congo and Sudan received a great deal of attention. Children’s issues were discussed, highlighting topics such as alternative tools for educating children in rural settings. A youth meeting gave young people the opportunity to interact with village elders and other older citizens on issues including unemployment, immigration and education. In Caracas, Share International co-workers hosted an information table, held lectures on Maitreya’s emergence and Transmission Meditation, and distributed large amounts of free literature. In Bamako, French-speaking co-workers organized an information table, held lectures, and conducted several media interviews, including one live radio interview broadcast nationwide. The information received a particularly enthusiastic response in Bamako, prompting many enquiries from people attending the forum there. 18 March 2006 – march for peace! A groundbreaking report by the United Nations Development Programme, launched at the Davos summit of world leaders in January 2006, claims that the world’s problems could be solved by a new approach to global finance. • aid agencies underwriting loans to market investors to lower interest rates. The British Chancellor of the Exchequer Gordon Brown said the report “shows how we can equip people and countries for a new global economy that combined greater prosperity and fairness both within and across nations”. However, some opponents say that action to curb consumption rather than give market incentives would be more likely to help poor countries, and that better solutions to world problems would be extra aid, extra protection, capping pollution and curbing speculative investment. Ray Nagin, the mayor of New Orleans, Louisiana, said in a public speech marking Martin Luther King day, 16 January 2006: “Surely God is mad at America. He sent us hurricane after hurricane after hurricane, and it’s destroyed and put stress on this country…. Surely he doesn’t approve of us being in Iraq under false pretences.” The mayor’s comments generated a largely negative public reaction, and he later apologized for the statement. In his book Half Gone, former oil consultant and Greenpeace adviser Jeremy Leggett warns that worldwide demand for oil and gas will soon outstrip supply, and that the public have been lulled into a false sense of security by reassurances from governments that oil reserves are more adequate than they in fact are and that new reserves will continue to be found in spite of evidence to the contrary. America’s need to import oil could be reduced by requiring domestic automobiles to increase fuel efficiency; instead it allows greater oil-profligate vehicles to be made. And its need for oil has led to “a disquieting descent into moral ambiguity”, forcing it into “a foreign policy maze that involves arming some despotic regimes, bombing others, and scrabbling for reasons to make the whole construct hang together”. Furthermore, Leggett argues: “At current rates of use, the global tank is going to run too low to fuel the growing demand sooner rather than later this century.” He divides the world into “late toppers” (those who believe there are ample oil supplies, 2 trillion barrels, still to be exploited and the “topping point” will not be reached until the 2030s) and the “early toppers” (ex-oil men who believe only 1 trillion remain to be found and that the peak, when oil reserves will start to decline, may be imminent). The early toppers have formed the organization the Association for the Study of Peak Oil (ASPO). The Association’s Colin Campbell, 40-year veteran of the oil industry, warned that the perception of decline in oil supply could be worse than the decline itself and could trigger panic in the stock exchange as soaring prices are followed by recessions. “A stock market crash is inevitable,” he said. This was echoed by Roger Booth, who spent his working life for Shell, and who believes that when the peak hits, “a crash of 1929 proportions is not improbable”. Renewable energy and not nuclear power is the answer, argues Leggett. He cites the town of Woking, UK, where the borough council has cut carbon dioxide emissions by 77 per cent since 1990 using a hybrid energy system of small electricity grids, combined heat and power, solar photovoltaics, and energy efficiency. Jeremy Leggett, Half Gone: Oil, gas, hot air and the global energy crisis. Portobello Books, London, UK, soon out in paperback.